Amir Khan says he counts Prime Minister David Cameron as "a good friend"
When Amir Khan was denied entry to the United States last September, there was one man he immediately thought to call. Luckily for him, British Prime Minister David Cameron was not too busy to pick up the phone to the Olympic silver medallist and former world champion. "They told me my visa was refused and I couldn't get on the plane. I rang him and said I had a bit of a problem," Khan explained in The Times. "He said 'hold on a minute', then he called me back and it was sorted." Cameron's intervention allowed Khan to fly to Las Vegas to commentate on the fight between Floyd Mayweather and Marcos Maidana. 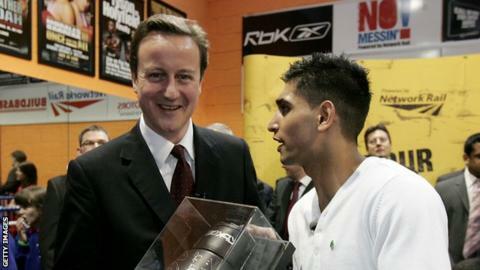 And former light-welterweight world champion Khan says Cameron is not his only heavyweight political ally. "I also met (former US secretary of state) Hillary Clinton in Washington and she asked me if I'd had problems, took my name and I haven't had problems [entering the US] since," Khan said. In a wide-ranging interview, Khan also criticised United Kingdom Independence Party (Ukip) leader Nigel Farage. Farage last week blamed the recent terror attacks in Paris on a "gross policy of multiculturalism". "What Nigel Farage said makes me angry," Khan said. "I've won a world title with the Union Jack proudly displayed on my shorts. "I want people to know that you can be Muslim and and British and succeed and not get into any negativity." Khan opened a community centre in his native Bolton with Cameron in 2008, but stopped short of pledging political support to the Prime Minister. "I don't back any party," he said. "I'm better off setting an example."